For decades, Pipex px® has been known as an innovator of FRP composites’ fabrication and design. Headquartered in Plymouth, United Kingdom, it also shares its home with the Resin Infusion Center of Excellence (R.I.C.E.). The center possesses one of the country’s largest five-axis CNC machines in use today. 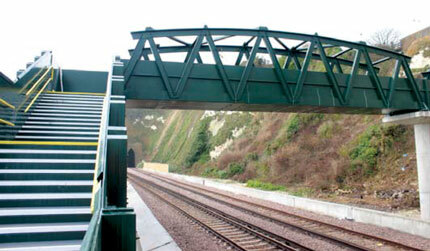 had been condemned after a severe storm at the Dover Sea Wall rail line in Kent, UK. Unlike most pedestrian footbridges, these components were designed as a hybrid systems, where pultruded components were assembled with resin infused components, uniting strength and aesthetics. The bridge decks, top cords and anti-slip phenolic wear plates were infused; the truss members, stairwells, landings and parapet panels were manufactured with Strongwell FRP pultruded EXTREN® sections and plates. Pipex px® manufactured and painted the bridge with a custom color in its state-of-the-art facility, where tooling and blot hole patterns were created with CNC technology. Upon the completion of the manufacturing process, water fill and lateral wind load tests were both performed in-house to support the FEA analysis. feet wide and over 11 feet high. After the installation, Pipex px®, in conjunction with Warwick University, outfitted the soffit of the structure with over 40 pressure sensors to measure train buffeting. The data will be collected and analyzed against various FRP structures around the county. The life expectancy of this design is expected to be more than 100 years.